This is a breathtakingly beautiful picture book by an exceptionally talented illustrator. One turns the pages slowly, almost reverentially, realising the absence of words whilst being swept along, always alert to the story line, by the magical illustrations. A father and son explore the wintery scene outside, with the wind blowing through the forest, the dancing snowflakes in the shapes of hares, foxes, reindeer. The two explorers become separated, and the boy, cold and lost, seeks night shelter in a cave. The next page-turn reveals a sky, black and velvety, with the constellations startlingly picked out in animal silhouettes, the boy sleeping below. Woken by a bright ray of sunshine, he finds he is surrounded by a number of curious but friendly creatures. Quick, turn another page and one is abruptly met by large, facial close ups of each of these creatures; owl and wart-hog, badger and mouse, squirrel and hare, and even the little boy himself, each with wide, round, staring eyes. The next page is filled by an enormous brown bear, seeming to carry on a conversation with the boy. Together the animals and the boy happily drink, eat, dance and play, and create some amazing cave paintings. The gentle touches of humour will not go unnoticed; the two tiny mice, alert and high up on the bear’s back, the bear sporting the boy’s cap as they cave paint. Meanwhile, the father is calling, calling for his son, shouting into the white wilderness. Wanting his father, Bear escorts the boy home, the reunion is joyous. The final page turns the seasons as man and boy sit in a grassy meadow in sunshine, along with all their new friends; racoon, fox, rabbit, mouse and big brown bear. 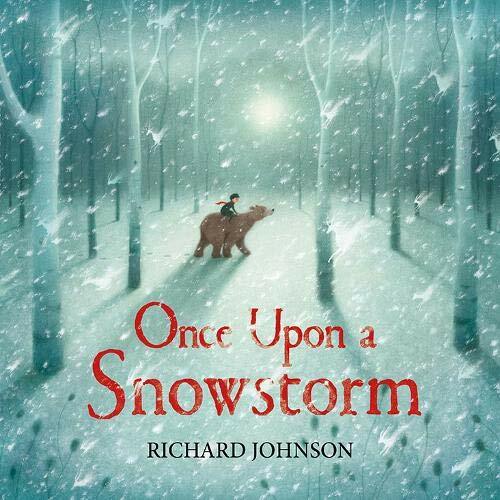 What a stunning, atmospheric book to enjoy with a child on a cold winter’s night. We are reminded of the enormous value of the wordless picture book in this not to be missed book. A child’s imagination will be set alight by the clarity and beauty of the magical pictures, whilst older readers will marvel at the atmosphere created by the text with these rich illustrations.